Gamecocks Lacrosse Looked Great and Played Great this Season! We would like to congratulate the South Carolina Gamecocks for putting on a great performance this weekend at the SELC tournament. It’s a unique experience to be involved in such a high-profile tournament and the hard work and determination that their players put forth put them in the place they were this weekend. They made it all the way to the final game where they ended up losing 9-7 in a hard-fought game against Virginia Tech. To honor this accomplishment, we thought we would highlight the lids they were wearing this season. First off, we love the South Carolina logo and color scheme. They’re an iconic brand in collegiate sports and we wanted to be sure that we highlighted that. South Carolina was looking for helmet decals that showed of the Gamecock logo rather than the “C” logo often seen on the football team’s helmets. This presented some unique challenges but also make for a really fun project. It can be difficult to display an intricate logo such as this within the narrow space available on the side of a lacrosse helmet. The best way to approach this problem is to keep things simple. The Gamecocks iconic logo creates plenty of interest without including additional elements. Our designers chose to make the logo oversized, cropping it to fit, for a dramatic look. The words “Forever to Thee” were added to the back-panel decal, paying homage to South Carolina’s alma mater. Much of the white helmet was left exposed furthering the clean look. Extra flare was added by including metallic colors to the palette. Most people think of standard silver and gold when they hear metallic, but there are many other metallic colors to choose from when designing lacrosse decals. The reflective shine of metallic garnett really made this project stand out. 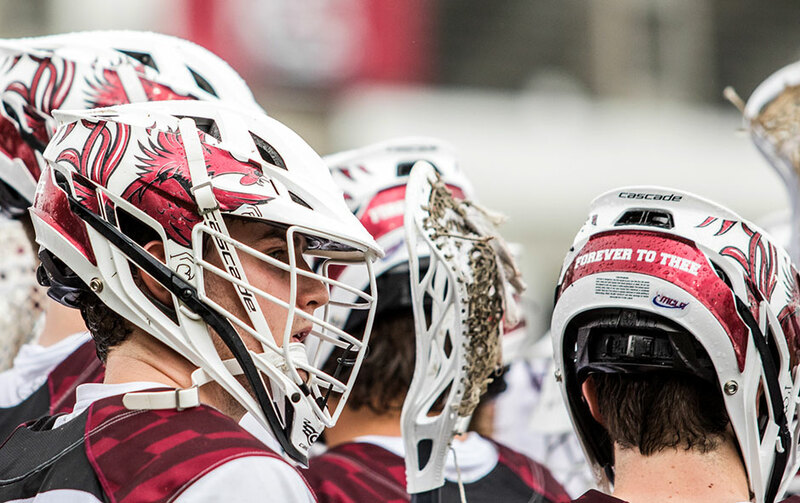 Once again, we want to congratulate the South Carolina lacrosse team on a great tournament. Their hard work and determination in the off-season really paid off and was evident throughout the year with being nationally ranked as high as #4. Be sure to follow them on social media if you want to keep up on the latest news. They can be found on Twitter @CocksLacrosse or facebook @GamecocksLacrosse. JackWraps® offers a full range of lacrosse helmet decals from traditional decal kits to full lacrosse helmet wraps. We would love to get started on a custom proof and quote for your squad. Reach out to one of our reps today to get the conversation started.